"Interesting Bear Facts for all Types of Bears"
From Black Bear sightings and Polar Bear Watching on Vacation to Teddy Bear Spotting .Have you ever had any black bear sightings where you live ? Or is Polar Bear Watching common in your country ? Do you have native bears in a local zoo or are the cuddly kind of plush toy bears more to your liking? If you are a real bear lover it does not really matter about what types of bear you like.. they all equally tug at our heart strings. Here you will find Louise Little Bear's discoveries from teddy bear spotting to black bear sightings from around the country - and the world when she starts her international bear watching tours. Take a peek at Louise Little Bear Watching the Bears..
Have you had any black bear sightings in your hometown or in vacation ? 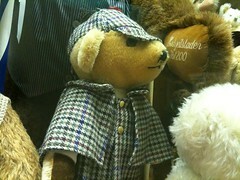 Have you spotted a favourite mystery teddy bear ? 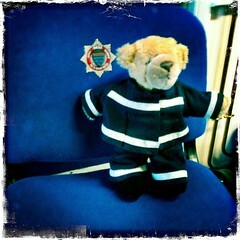 We spotted a real life fireman Bear , the bear mascot of a firestation in England . Dressed in a firefighter outfit the teddy bear mascot is ready to be on duty at all times .. It is fun to see so many firefighter teddies..
Firefighter Ted even has a storybook Here some more fabulous fireman teddy bears .. even with a real axe Teaching Fire safety can be made fun with all kinds of firefighter teddies lending a hand ..
a real firefighter bear with attitude..